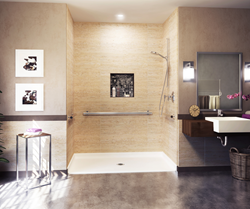 The new FRP pans are a great addition to Aquatic’s accessible offering because they enable builders and homeowners to redefine what accessible showers look like without breaking the bank. Aquatic, the leader in innovative and inspirational bathware, today announced availability of two new, attractively priced FRP pans for creating high style, code-compliant, accessible showers. Aquatic developed the new F6034DPAN and F3636DPAN pans so customers have even more options for affordably building out designer-look showers that are comfortable and safe for everyone, including people with limited mobility. Built to ADA/ANSI standards, both products are code compliant when properly installed. Builders, architects and homeowners can combine the pans with countless choices for tile-up applications to create the exact look they want. The pans work beautifully with walls made of ceramic, glass and/or stone tile and also inlays for truly unique and striking showers. F6034DPAN is a 60” x 34” x 3 3/8” roll-in pan featuring a wide opening with a low threshold that facilitates movement for people using wheelchairs or other mobility equipment. F3636DPAN is a 36” x 36” x 3 3/8” transfer pan designed with ease of use and economy of space in mind. Its low threshold comfortably accommodates transfer from a wheelchair to a bath seat. Both pans have pre-leveled bases for simple installation on level floors – a real time- and money-saving feature, and come in stock colors. Aquatic is introducing the new pans at a time when universal design is becoming more mainstream. Multigenerational households are on the rise so bathrooms have to meet the varying needs of children, parents and grandparents all living under the same roof. Many homeowners, too, are realizing that attractive, accessible bathrooms are a good investment – they are comfortable to use on a daily basis and, down the road, also increase resale value by appealing to a broader cross section of prospective buyers. Additionally, hotels and assisted living facilities are moving away from institutional-looking, accessible bath spaces and gravitating toward a more residential aesthetic.